Citation Information: J Clin Invest. 2018. https://doi.org/10.1172/JCI96400. Quantitative abnormalities of the von Willebrand factor–factor VIII (VWF-FVIII) complex associate with inherited bleeding or thrombotic disorders. Receptor-mediated interactions between plasma VWF-FVIII and phagocytic or immune cells can influence their hemostatic and immunogenic activities. Genetic association studies have demonstrated that variants in the STAB2 gene, which encodes the scavenger receptor stabilin-2, associate with plasma levels of VWF-FVIII. However, the mechanistic basis and pathophysiological consequences of this association are unknown. We have demonstrated that stabilin-2–expressing cells bind and internalize human VWF and FVIII in a VWF-dependent manner, and stabilin-2–deficient mice displayed prolonged human VWF-FVIII half-life compared with controls. The stabilin-2 variant p.E2377K significantly decreased stabilin-2 expression and impaired VWF endocytosis in a heterologous expression system, and common STAB2 variants associated with plasma VWF levels in type 1 von Willebrand disease patients. STAB2-deficient mice displayed a decreased immunogenic response to human VWF-FVIII complex, while coinfusion of human VWF-FVIII with the stabilin-2 ligand hyaluronic acid attenuated the immune response to exogenous FVIII. Collectively, these data suggest that stabilin-2 functions as both a clearance and an immunoregulatory receptor for VWF-FVIII, making stabilin-2 a novel molecular target for modification of the half-life of VWF-FVIII and the immune response to VWF-FVIII concentrates. Citation Information: J Clin Invest. 2018. https://doi.org/10.1172/JCI94645. Early T cell precursor acute lymphoblastic leukemia (ETP-ALL) is a new pathological entity with poor outcomes in T cell ALL (T-ALL) that is characterized by a high incidence of loss-of-function mutations in polycomb repressive complex 2 (PRC2) genes. We generated a mouse model of ETP-ALL by deleting Ezh2, one of the PRC2 genes, in p53-null hematopoietic cells. The loss of Ezh2 in p53-null hematopoietic cells impeded the differentiation of ETPs and eventually induced ETP-ALL–like disease in mice, indicating that PRC2 functions as a bona fide tumor suppressor in ETPs. A large portion of PRC2 target genes acquired DNA hypermethylation of their promoters following reductions in H3K27me3 levels upon the loss of Ezh2, which included pivotal T cell differentiation–regulating genes. The reactivation of a set of regulators by a DNA-demethylating agent, but not the transduction of single regulator genes, effectively induced the differentiation of ETP-ALL cells. Thus, PRC2 protects key T cell developmental regulators from DNA hypermethylation in order to keep them primed for activation upon subsequent differentiation phases, while its insufficiency predisposes ETPs to leukemic transformation. These results revealed a previously unrecognized epigenetic switch in response to PRC2 dysfunction and provide the basis for specific rational epigenetic therapy for ETP-ALL with PRC2 insufficiency. Citation Information: J Clin Invest. 2018. https://doi.org/10.1172/JCI90312. JAK2-V617F-positive chronic myeloproliferative neoplasia (CMN) is marked by dysfunction of integrins and adhesion molecules expressed on platelets, erythrocytes and leukocytes. However, the mechanism by which the two major leukocyte integrin chains, β1 and β2, mediate CMN pathophysiology remained unclear. β1 (α4β1; VLA-4) and β2 (αLβ2; LFA-1) integrins are essential regulators for attachment of leukocytes to endothelial cells. We here show enhanced adhesion of granulocytes from JAK2+/VF knock-in mice to vascular cell adhesion molecule 1 (VCAM1) and intercellular adhesion molecule 1 (ICAM1) coated surfaces. Soluble VCAM1 and ICAM1 ligand binding assays revealed increased affinity of β1 and β2 integrins for their respective ligands. For β1 integrins, this correlated with a structural change from the low to the high affinity conformation induced by JAK2-V617F. JAK2-V617F triggers constitutive activation of the integrin inside-out signaling molecule Rap1 resulting in translocation towards the cell membrane. Employing a venous thrombosis model, we demonstrate that neutralizing anti-VLA4 and anti-β2 integrin antibodies suppress pathologic thrombosis as observed in JAK2+/VF mice. In addition, aberrant homing of JAK2+/VF leukocytes to the spleen is inhibited by neutralizing anti-β2 antibodies and by pharmacologic inhibition of Rap1. Thus, our findings identify a cross talk between JAK2-V617F and integrin activation promoting pathologic thrombosis and abnormal trafficking of leukocytes to the spleen. .
Citation Information: J Clin Invest. 2018. https://doi.org/10.1172/JCI97117. Nucleophosmin (NPM1) is amongst the most frequently mutated genes in acute myeloid leukemia (AML). It is not known, however, how the resulting oncoprotein mutant-NPM1 is leukemogenic. To reveal the cellular machinery in which NPM1 participates in myeloid cells, we analyzed the endogenous NPM1 protein-interactome by mass-spectrometry, and discovered abundant amounts of the master transcription factor driver of monocyte lineage-differentiation PU.1 (SPI1). Mutant-NPM1, which aberrantly accumulates in cytoplasm, dislocated PU.1 into cytoplasm with it. CEBPA and RUNX1, the master transcription factors that collaborate with PU.1 to activate granulo-monocytic lineage-fates, remained nuclear, but without PU.1, their coregulator interactions were toggled from coactivators to corepressors, repressing instead of activating greater than 500 granulocyte and monocyte terminal-differentiation genes. An inhibitor of nuclear export, selinexor, by locking mutant-NPM1/PU.1 in the nucleus, activated terminal monocytic fates. Direct depletion of the corepressor DNA methyltransferase 1 (DNMT1) from the CEBPA/RUNX1 protein interactome using the clinical drug decitabine activated terminal granulocytic fates. Together, these non-cytotoxic treatments extended survival by greater than 160 days versus vehicle in a patient-derived xenotransplant model of NPM1/FLT3-mutated AML. In sum, mutant-NPM1 represses monocyte and granulocyte terminal-differentiation by disrupting PU.1/CEBPA/RUNX1 collaboration, a transforming action that can be reversed by pharmacodynamically-directed dosing of clinical small molecules. Citation Information: J Clin Invest. 2018. https://doi.org/10.1172/JCI95993. Citation Information: J Clin Invest. 2018. https://doi.org/10.1172/JCI99862. 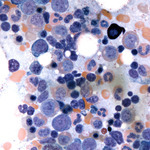 PRDM16 is a transcriptional co-regulator involved in translocations in acute myeloblastic leukemia (AML), myelodysplastic syndromes and T acute lymphoblastic leukemia that is highly expressed in and required for the maintenance of hematopoietic stem cells (HSCs), and can be aberrantly expressed in AML. Prdm16 is expressed as full-length (fPrdm16) and short (sPrdm16) isoforms, the latter lacking the N-terminal PR-domain. The role of both isoforms in normal and malignant hematopoiesis is unclear. We show here that fPrdm16 was critical for HSC maintenance, induced multiple genes involved in GTPase signaling and repressed inflammation, while sPrdm16 supported B-cell development biased towards marginal zone B-cells and induced an inflammatory signature. In a mouse model of human MLL-AF9 leukemia fPrdm16 extended latency, while sPrdm16 shortened latency and induced a strong inflammatory signature, including several cytokines and chemokines that are associated with myelodysplasia and with a worse prognosis in human AML. Finally, in human NPM1-mutant and in MLL-translocated AML high expression of PRDM16, which negatively impacts outcome, was associated with inflammatory gene expression, thus corroborating the mouse data. Our observations demonstrate distinct roles for Prdm16 isoforms in normal HSCs and AML, and identify sPrdm16 as one of the drivers of prognostically adverse inflammation in leukemia. Citation Information: J Clin Invest. 2018. https://doi.org/10.1172/JCI97072. While the genomic binding of MYC protein correlates with active epigenetic marks on chromatin, it remains largely unclear how major epigenetic mechanisms functionally impact the tumorigenic potential of MYC. Here we showed that compared to the catalytic subunits, the core subunits, including DPY30, of the major H3K4 methyltransferase complexes were frequently amplified in human cancers, and selectively upregulated in Burkitt lymphoma. We showed that DPY30 promoted expression of endogenous MYC, and was also functionally important for efficient binding of MYC to its genomic targets by regulating chromatin accessibility. Dpy30 heterozygosity did not affect normal animal physiology including life span, but significantly suppressed Myc-driven lymphomagenesis, as cells failed to combat oncogene-triggered apoptosis due to insufficient epigenetic modulation and expression of a subset of anti-apoptotic genes. Dpy30 reduction also greatly impeded MYC-dependent cellular transformation without affecting normal cell growth. These results suggest that MYC hijacks a major epigenetic pathway — H3K4 methylation — to facilitate its molecular activity in target binding and to coordinate its oncogenic program for efficient tumorigenesis, meanwhile creating “epigenetic vulnerability.” DPY30 and the H3K4 methylation pathway are thus potential epigenetic targets for treating certain MYC-driven cancers.